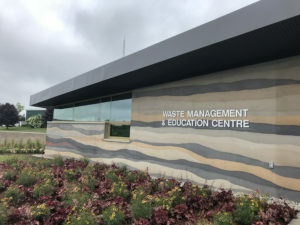 Building performance of the new Waste Management and Education Centre in Oxford County, Ont., has been designed to meet the New Buildings Institute’s (NBI’s) Zero Net Energy criteria. The fully electric building includes a solar photovoltaic (PV) system generating as much electricity as the facility consumes on a yearly basis. By incorporating a solar energy system onsite, the annual electrical operating cost for this building is reduced to the fixed charges to remain connected to the provincial electrical grid. Gateman-Milloy was the construction partner on the project, working closely with Oxford County and its other partners, including Michael A. Wilson Architect and Zon Engineering, on construction execution. The building is designed to meet the 71.5 kWh/m2 requirement of the NBI’s Zero Net Energy criteria. To take things one step further, it was decided the entire site including not just the new facility, but the landfill itself, would become a net-zero electricity consumer. Ongoing building performance monitoring will help Oxford County make sure it continues to optimize performance, and will provide valuable energy performance data that will be used to further inform future building designs. The entire solar PV system has a designed size of 120 kW, with 24 kW being required to net-zero the building’s energy use. In addition to utilizing solar energy to achieve net zero, the building is designed with energy efficiency in mind. The rammed earth walls are 559 mm (22 in.) thick and contain 203 mm (8 in.) of insulation with an R-value of 55. Additionally, there is significant insulation below the floor and in the roof to minimize the amount of electric heating and cooling required. The building also features triple-pane windows designed to reduce heat loss in the winter, and heat gain in the summer, while allowing natural daylight to reduce the amount of electricity required to power lighting. The building uses highly efficient HVAC equipment for heating and cooling, including two energy recovery ventilators (ERVs) to recover heat energy from the building’s exhaust air and use the energy to heat the incoming fresh air supply from outside. Lastly, the building was constructed with a septic system, so it will not be sending waste into the county infrastructure, and it uses well water so as not to draw on municipal water sources. The building is supported on standard concrete footing, and rammed earth walls serve as bearing walls for the wood-framed ceiling. Other wood features were worked into the building’s design to give it a rustic esthetic, including a locally sourced barn board feature wall. The building envelope and HVAC plan was a significant factor in reaching the net-zero goal. Ninety per cent of the HVAC ductwork was cast in place under the slab to help with net-zero requirements and reduce heat losses and gains. Additionally, all seams in the under-slab vapour barrier, as well as the insulation edges and penetrations were made airtight. Wood windows were used throughout the facility, but required additional measures (sealing) to ensure airtightness. On completion of construction, the building surpassed the design target of 1.0 air changes per hour at 50 Pa (ACH50). The final value achieved was 0.87 ACH50, which is the average of both the pressurization and depressurization tests.